Provenance: French private collection, auctioned on 15 December 2010 at Drouot, lot 41. Description: Finely worked bronze mount, possibly once decorating a belt or a saddle of a warrior of the steppe. 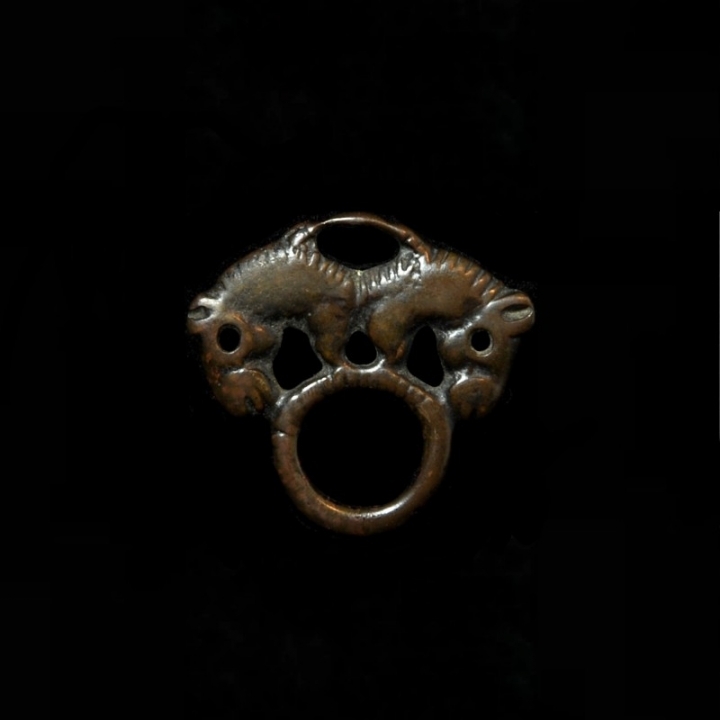 Two stylized horses sitting with their back parts connected on a bronze ring and turning sideways. The back fur with dotted lines, details of the nostrils and ears are carved. The eyes are punched. The opening was probably used to sew the mount on a leather. Bronzes like this are attributed to the so-called Ordos cult, named after the Ordos plateau in the south of inner Mongolia. From 6th to 2nd century B.C. the region was under Caucasian influence, where during this period the most eastern tribe of the Scythians might have settled. Subscribe to our newsletter – you will receive a monthly update about current exhibitions and participation at art fairs, as well as of new acquisitions. Plus: We introduce to you a special highlight of the month.